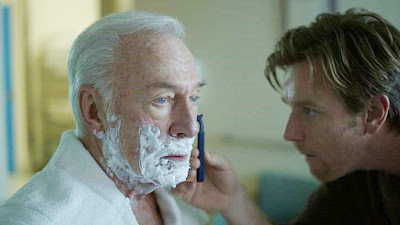 Thumbsucker's director Mike Mills opens his sophomore film The Beginners with Ewan McGregor packing up his father's belongings after he had passed away. Anyone who has had to go through someone else's belongings after they have left this world can relate to his discombobulated state of mind. He also has to take his dad's dog a Jack Russell terrier named Arthur home with him. McGregor's Oliver shows the dog around the apartment. Oliver is a graphic artist who is designing an album cover for a musical group, but his concept is called The Sads, a series of unhappy people. This reflects his over encompassing mood as he thinks about his father Hal (Christopher Plummer) a retired museum director who after his wife of 44 years passes away decides to come out of the closet. Oliver looks back on his dad's life since announcing he wanted to live openly as a gay man. His father at 75 years old embraces his new lifestyle by being an activist, having a younger lover (Goran Visnjic), and basically liberating himself as someone he had always meant to be. He reports to Oliver everything he discovers in his new life. The most he's ever communicated with his son. Four years later he is diagnosed with cancer. We watch Oliver and his dad grow close during those last years as his father tries to use his remaining time living his life to the fullest. He even thanks the oncologist after he delivers the bad news. Hal is determined to live with no regrets as his new rainbow community of friends gather around during his last days. Oliver always had a strange feeling about his parents seeing love but no passion. His elegant mother new of her husband's preferences, but married him anyway thinking he would change. His parents love each other in their way, but it doesn't make a good example for their son. It has influenced his ability to maintain a long lasting relationship. His co-workers worry a bit when they see his album design and force him out to a costume party where he ironically dresses like Freud giving party goers analysis time on the couch. He spots a pretty young woman there dressed as a man who has laryngitis and they hit it off spending the night together by just sleeping. Anna (Melanie Laurant) introduces herself the next morning. She's an actress living in a nice hotel while looking for work. Their energy and personalities are magnetic and they quickly blossom together without really knowing that much about each other. Since both are commitment-phobic Oliver's invitation to have her move into his house makes her back off and tell him she's going back to NY. Mike Mill based this story on his real life story of his dad who came out at the age of 75. The film could have been maudlin as it deals with the death of Hal. It would have gone too cute when the dog's thoughts are communicated by subtitles. The movie focus is on the strong performances. Christopher Plummer is still a fascinating film presence embodying Hal with an exuberance and joy of discovering life with a child like wonder. McGregor internalizes Oliver with all the past issues, fears and the heartbreak of losing his father. It reminds us that we, everyday are embarking on something new and different and not to run from the experience. It's a heady and heartfelt film that makes you feel good when leaving the theater.